Imagine Batman and Bane in some well-known films ... and now imagine a twist for Halloween. 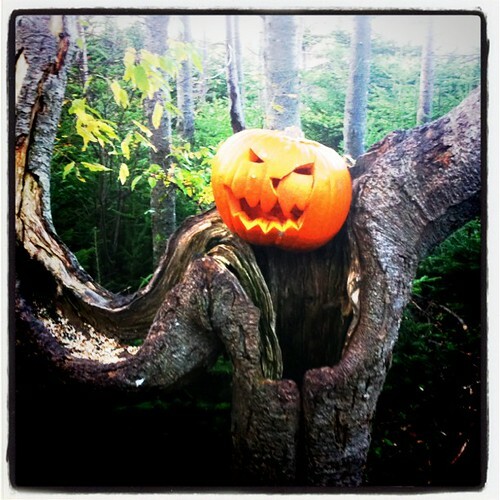 We came across this pumpkin during our regular walk along the Kent's Pond trail today. It had been left there by someone with a sense of humour, I'm guessing! This shirt, from TeeFury, arrived today for Nick. Martha had spotted it. It would have been especially appreciated on Halloween itself ... but it's just fine now. I posted about this New Yorker cover when it appeared in 2009 ... but I loved it so much, I wanted to look at it again. Tonight, incidentally, was the first time our son hit the neighbourhood on his own, so I wasn't one of those parents glancing at their phones while the little monsters tricked-or-treated. A tote bag that any young kid would want. Or an adult who's either irony-obsessed or just plain creepy. The poor pigs. The title of the new promotional video, Ham'O'Ween, says it all. That's the title Muppet Studios put on this Halloween-themed video featuring the Swedish Chef, and released a couple of years ago. We bought a pack of these yesterday - one for each of us, and one to spare. I called dibs on "This is my costume." 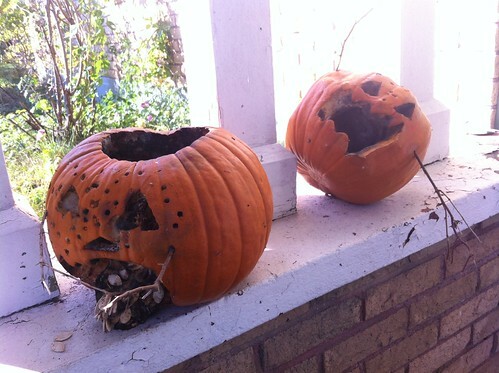 A couple of weeks ago, Nick carved two pumpkins, on the assumption that they would take on the appearance of zombies by the time Halloween rolled around. Looks like he's right on track! Nick has been dying to carve some pumpkins since, well, probably the spring. Last week, Martha and he picked out two small ones, and when they got him, he went straight to work. Zombie Pumpkin #1 is above. Zombie Pumpkin #2 can be seen below, stalking No. 1. I like the fitted sheet ghost best, having seen one once. By Adam Koford, and seen on Hobotopia. Carving a pumpkin or two is something two of the three of us are good at. (Hint: I'm not one of them.) We bought a pumpkin the other day. It's early, and I'm not sure how well it will last until Halloween, but then again Nick wants to have a zombie pumpkin. We'll keep you posted. 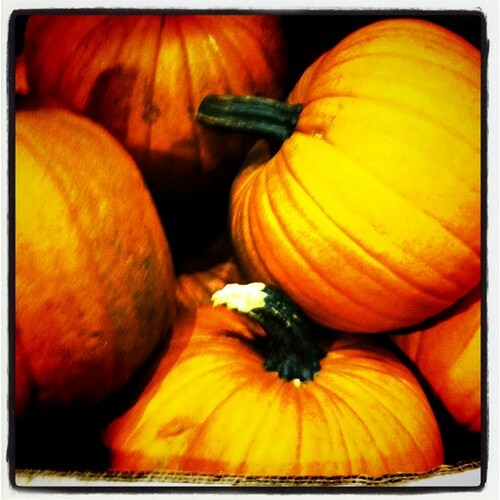 Martha incidentally is a dab hand with pumpkin puree. That's another thing to look forward, too! I snapped this over the weekend, while Martha was browsing the aisles at Pier One. Boo. 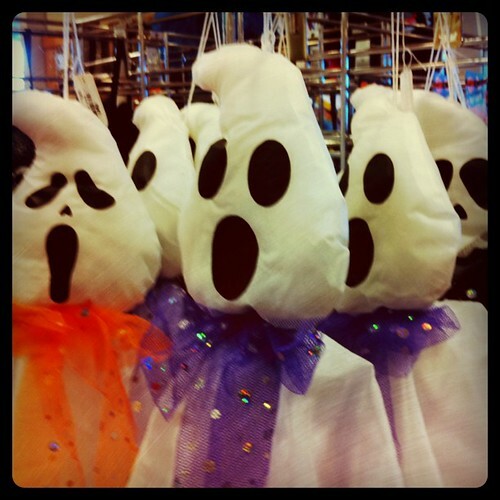 I snapped this a while back at Michael's, while Martha was hunting around for supplies. (I suspect I'm far from the only husband to stroll around there for something interesting to look at, or just pass the time.) There's a full Halloween display, of course. I thought these had that creepy-cute thing going on. Click on the image to go to my Flickr feed. 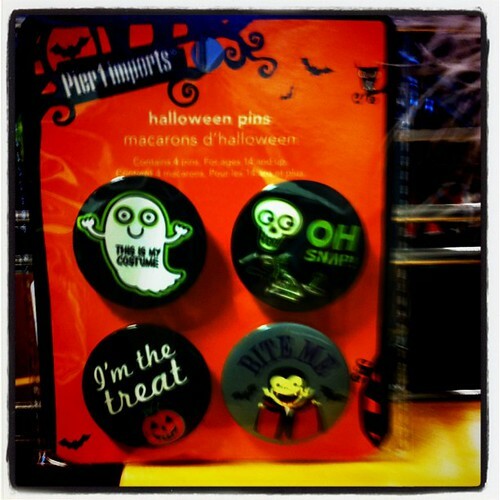 Halloween is a long way away, sure, but isn't this awesome? When Nick asked if we could get two pumpkins this year - one big one, one quite small - I had a hunch of what he had in mind. And then he carved it out, pretty much as he told me he would as he snickered in the car. My thanks to my friend Tim for pointing me to this picture, the best family outfit for Halloween I've seen this year, by far. As seen here. The New Yorker's Halloween cover is brilliant. Although I saw nary a parent out there tonight (mind you, we weren't out long) with a smartphone, I think artist Chris Ware - more from him here - nails something about the obsession grown-ups have with their gadgets, perhaps at the expense of their kids. This wasn't the plan. The plan, hatched in February, when we visited Disney World, was that Nick was going to go as the Sorcerer's Apprentice. 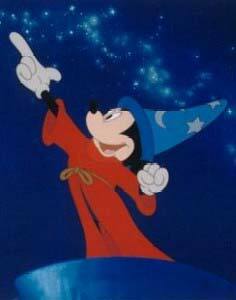 (You know, Mickey Mouse in the red cape and blue hat, the one with the stars. The side deal, which I was willing to go along with, is that I would go as one of the brooms carrying pails of water (the pails actually holding treats and such), with Martha more than willing, somehow, to turn a grass skirt into the broom part of my costue. Like I said, we were all willing to do what we had to do. Well, that got cast aside, as nine-year-old boys are wont to do. Instead, in September he informed us that he was going out as the Grim Reaper. And that was that. Martha stitched the costume this week, and it turned out really well, given that it was just one big heaping pile of fabric at the start. Our friends Christine and John donated their (plastic) scythe. I'm suggesting that Nick go around tonight with a sack with "soul food" on it, for his snacks. One of these years, I'll get around to carving one of those brilliant pumpkins that people talk about for years. 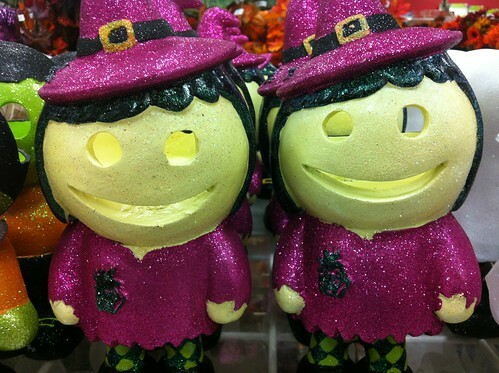 In the meantime, here's a link to a collection of pumpkins with social media motifs. Very clever. Thus was our son Nick's introduction to Hamlet. "What's with the Shakespeare stuff?" he asked. Good question. And I'm sure he'll have decades to think about how rich that answer can be.